snap one with company arriving. Family dinners - sometimes they are easy and other times a struggle. Both sides of the family come from the meat and potatoes background. They want a slab of animal protein with fixings. As a former Vegetarian and someone who loves diversity in my food, I get bored. One of my bonus family members doesn't eat cheese, so easy alternatives like lasagna and enchiladas are out. I do love roasted and mashed potatoes but long to spread my wings. While my early years I didn't wasn't served rice and pasta side dishes at home, in my teens it did become more popular - mostly Uncle Ben's converted rice or Minute Rice. My kids have had a lot more rice, especially when I made began to make stir fry dinners, but I was struggling to find a rice dish to serve with meat at family dinners that hit the mark. I tried a recipe here and there with not a lot of positive response. Light fluffy rice seemed to get cold on the plate very quickly. It's also a bit hard to eat with a fork. After exploring a way to make non-traditional Paella that would suit my family's tastes - see recipe HERE - I became intrigued by Italian Arborio Rice. This short, round grain is used quite a bit in creamy risottos. I do like risotto, but had no intention of standing over a stove stirring and stirring while adding small amounts of water, especially as company walked in the door. 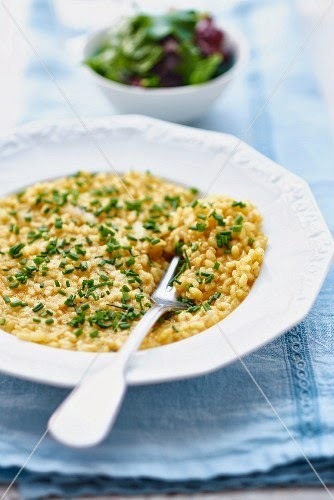 But the wetter, starchier nature of dishes created with Arborio rice meant they would not only hold heat better, but would be a little easier to eat. 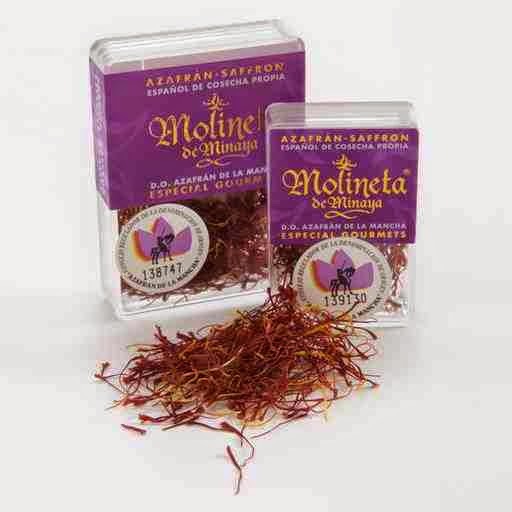 With another family dinner approaching, I decided to do an internet search to see if I could find inspiration and stumbled across this intriguing recipe offering a mix of saffron, lemon juice, lemon rind and chives. The rice was also only stirred at the start and then once during the cooking process - so low maintenance. The saffron would give it a beautiful yellow colour, the lemon juice and rind a nice tang, and the chives a pop of green. The aroma that wafted from the casserole when I uncovered it immediately caught everyone's attention. It was a hit! I did change the original recipe slightly to change the number of servings. While it said it served 8, I knew those would be VERY small helpings and I hate to run short. So I made a few slight increases to make sure there would be enough for everyone. Also - while this is a risotto style rice, this recipe does not create a creamy, labour intensive risotto. No worries as it worked out perfectly. Melt butter in heavy, large saucepan over medium heat. Add shallots and saffron and cook 3 minutes, stirring occasionally. Add rice and stir to coat. Add stock and lemon juice; bring to boil. Reduce heat to low, stir and cover. Let simmer until creamy and tender, stirring vigorously every 10 minutes, 20 to 25 minutes. Add lemon peel and chives. Season with salt and pepper. Stir vigorously until well combined.